Join nearly 200 people who have already signed up the Winton Trail Run! It’s on Saturday 8th April 2017 from here at Winton Castle, Pencaitland, East Lothian EH34 5AT. The Winton Trail Run over 10K, 5K and Family 3.5K offers a unique opportunity to run off-road through some of East Lothian’s most beautiful countryside on Winton Estate. A record 600 runners took part in 2016 and it was a fantastic, sunny day. Formerly the Pencaitland Fun Run, the event is now into its 5th year. The run raises funds for Marie Curie and local registered charities, the Pencaitland Primary School PTA and Pencaitland Playgroup. There are clearly marked and marshalled off road routes along the Winton Walks for everyone to enjoy, as well as refreshments to return to. More information on the Winton Trail Run here. 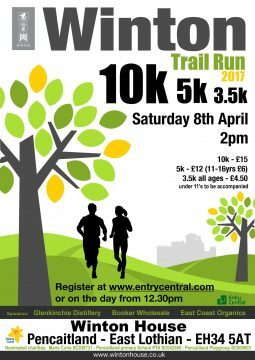 Book your places for 8th April 2017 at Entry Central now!